Thecus already has an 8 bay rackmount NAS, the N8200XXX featuring a quick Intel® Atom™ processor and providing a very good value. This product fills an important niche in the market and provides users with an excellently priced large storage NAS. Before this, Thecus was already known for innovative and powerful appliances such as the N8800SAS with SAS support and heavy-loaded hardware. With the N8900, they’ve decided to go one step further in performance and provide a state of the art NAS device for the most demanding users: USB3.0, HDMI output, and 10Gb Ethernet compatibility are only some of the key features included. Let’s have a closer look. 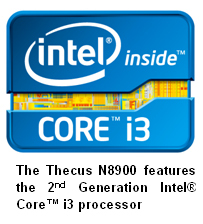 As part of the latest generation of leading CPUs on the market, the Intel® Core™ i3-2120 processor integrates 2 cores at 3.3GHz to match the N8900’s no less than 8GB of DDR3 memory. Fast RAID operations, multitasking, reactive virtualized environments, application serving, and more; anything your business needs. To maximize your data safety, the N8900 benefits from a unique Thecus feature: Dual DOM design. The DOM (Disk On Module) is the equivalent of the BIOS on a computer: if it fails or gets corrupted for any reason, all your data can be lost forever. Thanks to Thecus Dual DOM design, there is a second DOM ready to replace or reprogram the first one. In this way, Thecus has reduced DOM failures by 67%! The N8900 also embeds what’s best for connectivity: two USB 3.0 ports, audio output/input, and an HDMI connection. Those will also give users even more possibilities when writing their own modules thanks to the brand new Thecus software developer kit. In addition, the N8900 is built with several free PCI-e extension slots (one 4-lane and two 8-lane slots), which can be used for virtually everything. For instance, you can decide to add more USB 3.0 or eSATA slots. For companies with higher-end needs, you can choose to install a 10Gb Ethernet adapter, allowing you to use either traditional fiber or high-performance/low-cost base-T cables! Speaking of flexibility, the N8900 is compatible with every common (and not so common) file system: Ext3, Ext4, and XFS. 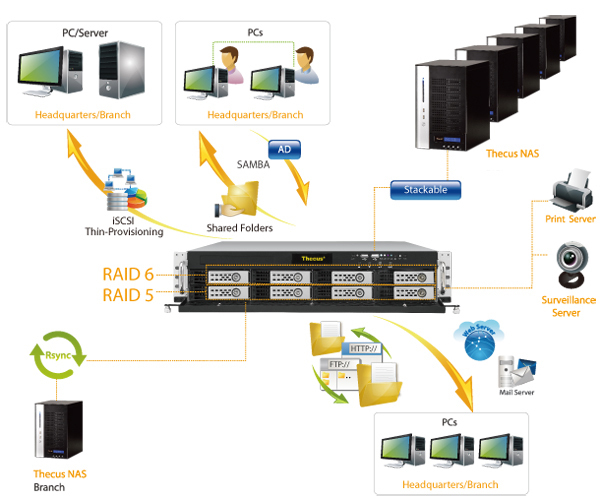 There are also 6 modes of link aggregation supported to maximize performance. Coupled with 6G SAS hard disks, the final results can’t be wrong!